Located just west of Raleigh, north of Cary and Apex, Morrisville is a great option for anyone looking to live close to the city at a more affordable price. The homes for sale in Morrisville range in price and size from smaller condos and townhomes to luxurious mansions. There is sure to be something you like in Morrisville and is a convenient place to live for anyone working in Research Triangle Park, North Raleigh or Cary. Homes for sale in Morrisville are some of the best properties you will find in Raleigh. Morrisville is a newer area so the homes are more often built recently vs. to older homes you may find in Raleigh or Durham. The brier creek area is located just north of Morrisville with easy access to both Research Triangle Park and the Raleigh-Durham International Airport. Above you will find all available Morrisville real estate listings. If you'd like to see any of these properties let us know and we will be happy to schedule an appointment to show you the property you're interested in. The Morrisville real estate market has seen some serious appreciation since last year and expect that trend to continue with the current population growth. Builders and developers have targeted Morrisville as one of the areas they expect will attract people moving to the Raleigh area. The large number of new construction homes being built in Morrisville is a direct result of that. When buying or selling a home in Morrisville make sure you're working with a local Morrisville area Realtor®. Start by doing research on potential Realtors® and definitely interview more than one so you know which agent you like the best. Often clients will interview us first and before we let them sign on as our clients we ask they interview at least one or two more to make sure they're confident in their decision by knowing what else is out there. Buying and selling real estate is some of the largest financial transactions you will be a part of in your lifetime so you'll want to make sure the people you work with are the best. Anyone who can't chat with you about the local Raleigh Real Estate numbers and trends from the moment you meet them is someone you probably don't want to work with. A full time Realtor® spends every day working with clients and studying the numbers to ensure that their clients are receiving the best deals possible. If you are in the market to buy a home in Morrisville, NC you've chosen a great area to live! Far enough away from Raleigh and Durham for some relaxation, and close enough where you're only 15 minutes from all the action. 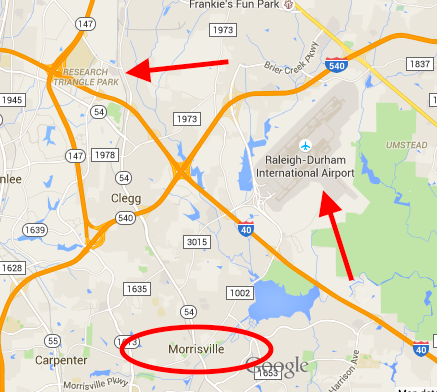 One thing you'll want to be careful of when purchasing real estate in Morrisville is that you aren't in any flight paths from Raleigh-Durham International airport if noise bothers you. There are a number of great neighborhoods and communities to choose from in Morrisville with a variety of types of homes.